Rephrasing work requires you to fully rewrite the original but use very different words and often different sentence and paragraph structures. The resultant work will more often than not be of a similar length but will read very differently from the original but the original meaning will be fully preserved. Summarizing text, however, requires you to take a work, draw out the important points of it and then present those points in an often much-condensed version. For instance, the Abstract for a thesis will be a just 400 word summary of a 50 or more page document. Summarizing and paraphrasing PowerPoint is a simple way to either create a PowerPoint presentation using other written works such as academic papers or articles or to create articles and papers using a PowerPoint presentation. Rewriting PowerPoint is no different from any other style of rewriting. Most articles or papers are organized into paragraphs, each paragraph usually covering a single aspect of the subject being discussed. Therefore you should look at each paragraph as being a single slide within the PowerPoint presentation that you wish to produce or each slide as being a paragraph for the article you will write. Whichever way around you are working first seek to fully understand what each slide or paragraph actually means; to be able to paraphrase PowerPoint you have to understand the original. Then rewrite the original using your own words, ensure that you avoid copying phrases and sections from the original, your wording has to look completely different; not just the same words in a slightly different order. When going from an article or paper to PowerPoint it may be more suitable to summarize the original rather than rewording PowerPoint as most PowerPoint want to be as brief and to the point as possible. Do not just use your thesaurus or spinner programs to take the original and swap each word for a similar word, you will often subtly change the original meaning if you do not fully understand the words being used or worse; spinner programs tend to produce complete garbage unless you are a complete expert in their use. Search engines however fully understand these methods and can still recognize copied material that has been produced using these methods. Our experts are able to paraphrase or summarize any document that you may need help with. Our service is highly specialized and you will be paired with a writer that holds a higher degree in the field of your original document. This ensures a full understanding of the content as well as making sure that you will receive a concise and accurate version. 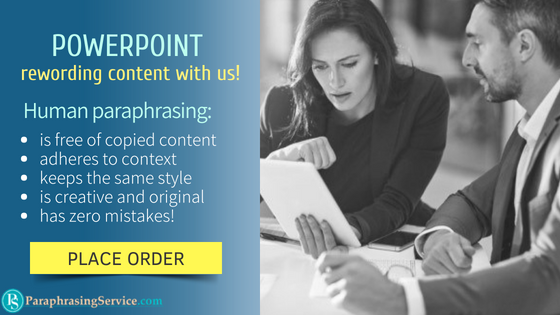 Your paraphrasing services can help you create impressive and unique contents that will be surely yours. Hire a professional writer who knows how to reword the text correctly. As you might know, paraphrasing isn’t only about changing the words into their synonyms, but also by text into an original content. You can expect that your professional writer can spin the content correctly by ensuring that they get the gist of the original content. This way, you can have peace of mind that the same lovely content can be used by your website without committing plagiarism. You can hire your pro writer today so that you can paraphrase a website. Upload unique and engaging contents in your website through your paraphrased content. For rephrasing PowerPoint you cannot go wrong with using our experts! Find out more about us!